You all have seen Harlow make an appearance occasionally here on the blog and, while she’ll spend most of the day on the couch working with me or following me around when I prep for Jackson’s birthday party, I’m sure she secretly loves a whole blog post dedicated just to her! 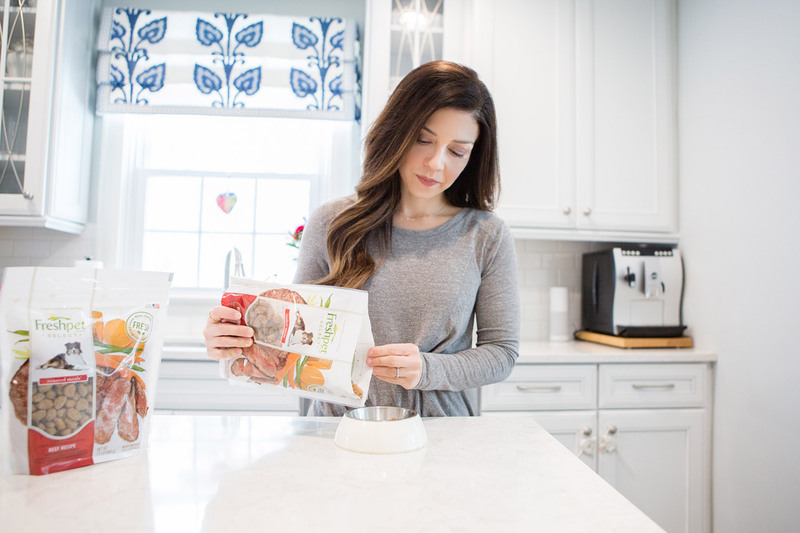 There are few things Harlow likes better than having her photo taken and trying new food (although that new food is usually unintentionally shared by her brother), so when we had the opportunity to try FreshPet with her, I thought it would be a great product line to learn more about. 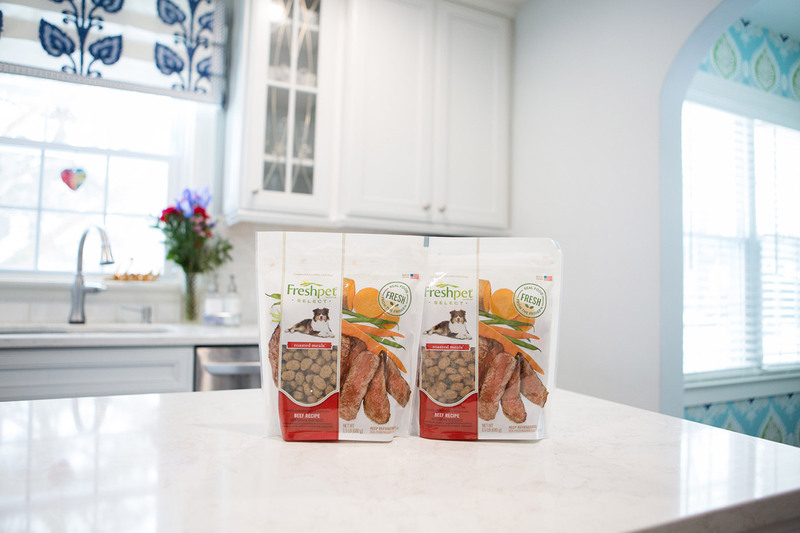 We’ve been working on eating healthier ourselves and focusing on fresh, real food in our own meals and I liked that FreshPet does exactly that for dogs. The food is all-natural and made in small batches, with fresh ingredients (like the ones you would cook for yourself) and no preservatives. The one we tried has beef, shredded sweet potatoes, green beans and carrots. You also store it in the fridge, so it stays fresh but also doesn’t last for an eternity like some dry food seems to. I personally see that as a perk because then Harlow is always getting the freshest food we have for her. Little Miss has a bit of a sensitive stomach, and we learned that the hard way when we switched her from puppy food to adult dog food. So with the FreshPet food, I’ve sprinkled it in with her dry food and also given it to her as treats. Even though change can be iffy with dog food, she is always really excited about it and scarfs it down when she gets it. Just like most dog parents, we’d say that our little Harlow is incredibly spoiled! We are as good with her as we are with the boys about healthy food, regular doctor appointments and all of the things that will keep her healthy, playful and happy. 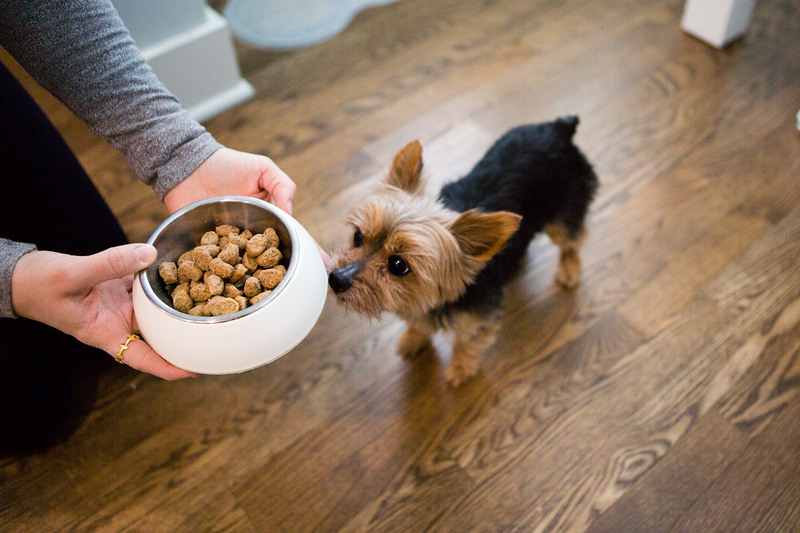 To learn more about how FreshPet can fit into that for you and your dog, visit their website here. Thank you to FreshPet for sponsoring this post! I appreciate you supporting the brands that we love and that help make the HSS feed possible.